The Autumn Statement happened today and obviously featured a lot of our statistics. 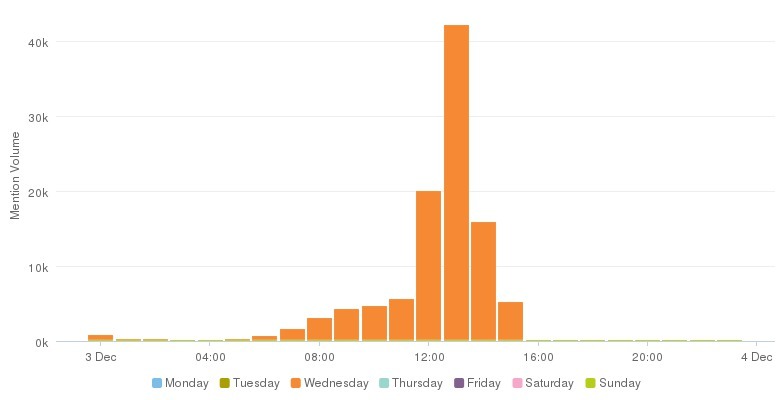 Here’s a sense of the volume of mentions over the last few days. (It started trending a day or so ago, so the explosion really shows how much chat there was.) Whilst in the past we haven’t tweeted along to these events, recent efforts in republishing our content around TV programming has proved so successful, we wanted to progress onto live events as well. Rather than fact checking as such, our job is to inform debate and encourage greater use and understanding of our statistics so tweeting signposts to our content should it come up is an obvious fit. For a while now, we’ve had tweeting statisticians at ONS which have had lots of mini successes. What started as a trial has reached day-to-day for us, we just need scale and a greater breadth of authors – something we’re working on organically. Anyway, the statisticians were the face of our content today with @ONS retweeting so it still reached the same users but they could see and interact with the statistician behind the numbers and relationships beyond today, can grow. This interactive @ONS chart on the UK economy is brilliant. http://t.co/jDY5rdmLgc pic.twitter.com/a7Y5AIxnU5"
an interactive as they nearly always are for us. Something to bear in mind for next time.